At Hudock Capital we believe in finding out what is most important to you and creating a plan to make that happen. Every member of our team is committed to listening intently to help you discover what is most important in your life, and then we plan your money around it. At the core of this effort is building a long-term, dynamic relationship with you – one focused on helping you live the life that you’ve imagined. The Certified Investment Management Analyst (CIMA) certification program is the only credential designed specifically to recognize the achievement of financial professionals who attain a level of competency as an advanced investment consultant. It is also the only financial services credential recognized in the U.S. to have met an international standard for personal certification ( ISO 17024 ) and has earned accreditation by the American National Standards Institute. Barbara Hudock holds CIMA certification through The Wharton School, an Aresty Institute of Executive Education at the University of Pennsylvania. Certification provides successful financial planning advisors the skills and experience necessary to integrate a complex body of financial management knowledge, while ethically contributing to prudent wealth management decisions by providing objective advice and guidance, to high net worth clients. Shelley Whitnack holds the Certified Financial Planner (CFP®) certification signifying completion of rigorous education, testing, experience and ongoing renewal requirements of the CFP Board which require certified advisors to place client interests above their own. To earn the CFP® certification a financial advisor must pass an exam that tests knowledge of insurance, investment planning, tax planning, retirement planning, employee benefits and estate planning. When it comes to ethics and professional responsibility, CFP® professionals are held to the highest of standards. The Certified Portfolio Manager (CPM) designation, held by both Barbara Hudock and Michael Hudock, Jr., is a collaboration of the Academy of Certified Portfolio Managers and Columbia University. The designation program provides a deeper understanding of security analysis and asset allocation as well as portfolio management and focuses on three vital areas: Valuation Analysis, Portfolio Construction and Risk Management. Christina Cline holds the Registered Paraplanner (RP®) designation signifying completion of a course of study encompassing the financial planning process, the five disciplines of financial planning and general financial planning concepts, terminology and product categories. Additionally, individuals must pass an end-of-course examination that tests their ability to synthesize complex concepts and apply theoretical concepts to real-life situations. Michael Hudock, Jr. has earned the Preparing Heirs designation from the Institute of Preparing Heirs, an innovative training company serving wealth advisors who provide services and products to high and ultra-high net worth clients. The designation training provides proficient wealth advisors with tools and ongoing support to prepare families for successful generational wealth transfer. They understand the value of working with a wealth partner – someone with whom they can develop a dynamic relationship to build and preserve wealth. They share our investment philosophy – one based on a highly personalized and principled approach to investing with purpose. They have the capacity, commitment and discipline to set and meet meaningful financial goals. They are passionate about their lives and are people with whom we enjoy spending time. They are compasionate individuals who believe in making a difference in the lives of others. Pure and simple. We promise to do what is in your best interest. We will spend as much time as needed in order to reach a level of mutual trust, so when you leave our office you know we are doing everything we can to help meet and exceed the goals set forth. It is important to you and is very important to us as well. You can rest assured that we will do what we say we will do, and we expect you to share that same commitment to your success. We are in touch with you on a regular basis. We have at least annual, and when appropriate, more frequent review meetings to monitor and recommend any changes. This is a vital part of our practice. The commitment to do what is right for you, sometimes at the expense of our own profitability, is the necessary foundation for the kind of trust that brings about lasting relationships. No matter which team member you contact, the message will be the same. We adhere to the philosophy that in doing the right thing that is in the best interests of our clients at all times, profitability will take care of itself via client satisfaction and referrals. At Hudock Capital, continuing education is essential to creating excellence. We are members of many professional organizations and regularly attend conferences and courses to enhance our knowledge so we can better serve you. We find that starting most relationships successfully with a personal investment plan helps us establish and prioritize your values and goals. Essential to a well-balanced portfolio, purpose-driven investment strategies allow us to take the emotional issues largely out of the dialogue. Rebalancing regularly is an integral part of our Investment Policy. As investment professionals, we pursue an ongoing search for outstanding money managers at all times in order to help enhance our clients’ portfolios while holding the managers we use to strict guidelines. We are committed to giving back and to being a major asset in the communities where we work and live. We meet regularly to discuss how we can best deploy our talents and resources to help the various nonprofit organizations in the communities we serve. Every member of our firm is encouraged to volunteer their time to nonprofit organizations of their choice. Our firm gives team members time off to devote to local nonprofits and matches contributions – up to $5,000 – to nonprofit organizations that are made by any member of our firm. In fact, since starting our firm, Barbara Hudock and our firm have made over $3,000,000 in charitable contributions to benefit many important nonprofit organizations serving our local communities. This level of support reflects our commitment to helping our broader community. It is an important part of who we are. Our core purpose, our passion, is to make a positive and profound difference in the lives of our clients and in the communities we serve. Published by Dow Jones & Company since 1921, Barron’s covers U.S. financial information, market developments and relevant statistics. The publication releases this list annually to recognize leading financial advisors within the industry on the basis of the volume of assets under management by the advisor and his or her team, revenues produced for the advisor’s firm, the advisor’s regulatory record, the advisor’s quality of practice, and the advisor’s and his or her firm’s philanthropic work. Barron’s Magazine The Top 1,000 Advisors, February 9, 2009, February 22, 2010, February 21, 2011, February 18, 2013. 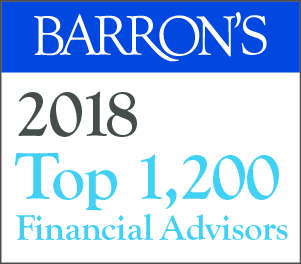 Barron’s Magazine The Top 1,200 Advisors, February 24, 2014, February 23, 2015, March 6, 2017, March 12, 2018.